We’d love your help. 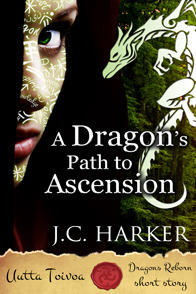 Let us know what’s wrong with this preview of A Dragon's Path to Ascension by J.C. Harker. Tharia is faced with a harsh choice, a decision all young Toivoan Dragons must make. Destined for Ascension and the vast power that comes with it, they have to decide if they are willing to pay the ultimate price. Tharia had always been reluctant to get blood on her hands. Instead, she chose the life of a recluse, sacrificing power for simplicity and peace. Once her own lif Tharia is faced with a harsh choice, a decision all young Toivoan Dragons must make. Destined for Ascension and the vast power that comes with it, they have to decide if they are willing to pay the ultimate price. Tharia had always been reluctant to get blood on her hands. Instead, she chose the life of a recluse, sacrificing power for simplicity and peace. Once her own life is at stake, however, how long will she resist giving in to her fate? To ask other readers questions about A Dragon's Path to Ascension, please sign up. Fantasy is one of those genres that is difficult for me. Some of my favorite authors belong to this genre, indeed a few of them are thought the very definition of it. As such I rarely find new titles wholly original. Perhaps this is why I found J.C. Harker's A Dragon's Path to Ascension so strikingly. A short piece in a genre of which I am an admittedly harsh judge, I never expected it to be whisked away on the wings of dragon into a world of such intense imagination. I am not going to go into th Fantasy is one of those genres that is difficult for me. Some of my favorite authors belong to this genre, indeed a few of them are thought the very definition of it. As such I rarely find new titles wholly original. Perhaps this is why I found J.C. Harker's A Dragon's Path to Ascension so strikingly. A short piece in a genre of which I am an admittedly harsh judge, I never expected it to be whisked away on the wings of dragon into a world of such intense imagination. I am not going to go into the story, the novella is so short I am afraid any real examination of the plot would give something away and ruin it for other readers. Just the same, the concept of the Toivoans is nothing short of inspired and the manner in which their story is told, well suffice it to say I was most impressed by what Harker put together. *I received a free copy of this book by the author in exchange for an honest review. Tharia wants to live a peaceful life but when hunters start coming after her, she must face her destiny and ascend to full dragon power. To do this, she must spill the blood of her kin in a fight to the death. This was a good fantasy story with a young woman trying to live a quiet life and unwilling to choose violence even if it leads her to her destiny. When her enemies come after her, she no longer has a choice. *I received a free copy of this book by the author in exchange for an honest review. This was a good fantasy story with a young woman trying to live a quiet life and unwilling to choose violence even if it leads her to her destiny. When her enemies come after her, she no longer has a choice. The plot was good with a decent amount of action as she tries to get away from the hunters. Tharia and her little dragon friend were interesting characters as well. I'm just starting to try a few more fantasy based stories and this one certainly was enjoyable enough to hold my attention. This is a short story about a young woman named Tharia, who is part dragon. It's part of the Dragon's Reborn Series. On the run from hunters after her hide, Tharia makes the choice to Ascend, even though it will mean killing one of her own kind. I really enjoyed this story. It was exciting to follow Tharia as she fled her pursuers, and the battle between her and Kaima was unique and very well written. This story has some great visuals. If you like dragons and magic and have a little time on hand This is a short story about a young woman named Tharia, who is part dragon. It's part of the Dragon's Reborn Series. On the run from hunters after her hide, Tharia makes the choice to Ascend, even though it will mean killing one of her own kind. I really enjoyed this story. It was exciting to follow Tharia as she fled her pursuers, and the battle between her and Kaima was unique and very well written. This story has some great visuals. If you like dragons and magic and have a little time on hand to be swept away on an engaging journey with an unexpected ending, then I highly recommend this short story. The story is also strong as a standalone, with a twist at the end that you wouldn't expect in this kind of novella. I absolutely loved this book - I just wish it had been longer. I was able to enter completely into the world of J C Harker. The story is well structured and the characters are appealing. Kept me enthralled throughout and I highly recommend. A great short story that doesn't skimp on plot or action. An interesting and refreshing take on dragons, that engages the reader and sets the imagination free. I am rather undecided about this book. On one hand I was engaged and it wasn’t predictable. It was unique and surprisingly dark. On the other hand it was only 6 chapters, not long enough to really get into the character or the world. I would have liked more detail and more character development. It was quite action driven, which would have been fine if there was more substance to the story, but there wasn’t. I gradually pieced together what these Toivoans were: half dragon, half human, that can draw on their element for power, and they have to kill two of their kind to “Ascend”. The problem is…these answers gave rise to more questions. What exactly is Ascending? Who is this Empress? Why do hunters want Toivoan skins? Although the story-world building was good, the writing came across heavy handed with long descriptions I was tempted to skim over. I was pleasantly surprised with the unexpected twist near the end. J.C. Harker's captivating novella, A Dragon's Path to Ascension, is a true fantasy delight. When I came across this novella I was delighted. The characters are engrossing, the mechanics behind the Ascension are well formed and cleverly executed, and any reader will be absorbed into the plot at once. Tharia is a young Toivoian, part dragon part human. She lives as an outsider, disguising herself among the humans as an outcast druid. Tharia's life is constantly in peril, for her kind is valued for J.C. Harker's captivating novella, A Dragon's Path to Ascension, is a true fantasy delight. When I came across this novella I was delighted. The characters are engrossing, the mechanics behind the Ascension are well formed and cleverly executed, and any reader will be absorbed into the plot at once. Tharia is a young Toivoian, part dragon part human. She lives as an outsider, disguising herself among the humans as an outcast druid. Tharia's life is constantly in peril, for her kind is valued for their magic and their skin. Together with Dru, her young dragon, Tharia must survive as best she can, at any price.